Students who use technology to collaborate, create something, or apply information to a new problem are harnessing technology to deepen learning, according to John B. King, Jr., president of the Education Trust and former U.S. Secretary of Education. But that approach is not guaranteed, he added. Secretary King recently discussed global digital education with an audience of educators from 32 cities on 5 continents. The group gathered in New York City to consider student learning outcomes, the focus of a new and groundbreaking Global Cities report. 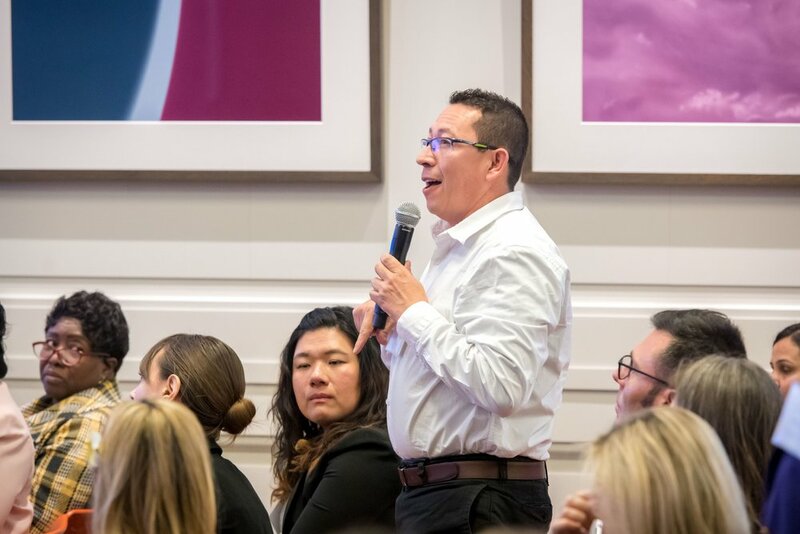 As members of the Global Scholars worldwide educator network, each teacher, principal, and school district administrator in the audience was working to create opportunities for students to go deeper with both global and digital learning. Secretary King emphasized the “sweat” factor in making sure that students were actively advancing in critical thinking and digital literacy. And he did not only mean the educator’s sweat. “Do you construct activities where the kids have to do the intellectual heavy lifting? As a principal, I used to say to teachers, ‘Who’s doing the sweating in the classroom?’ The intellectual sweating? If the teacher’s doing all the intellectual sweating, you’re not doing it right! — John B. King, Jr.
Secretary King emphasized that this active approach to digital and global learning should not be limited to a particular lesson or even subject, but rather reflect a general orientation toward learning in every subject. This need and problem are addressed in our paper Evaluating Global Digital Education: Student Outcomes Framework, co-published by Bloomberg Philanthropies and the Organisation for Economic Co-operation and Development (OECD). We are officially releasing the paper later this week at “Global Competency in a Changing World,” our New York City symposium. The strength of the paper is that evidence comes from academic literature and the world of practice, including data from Global Scholars, the digital exchange program that we created and operate. It connects 10-to-13 year old students in e-classrooms with peers in other countries to accomplish a project-based, technology-integrated, and interdisciplinary curriculum about a global problem. Classes engage with one another in discussion boards throughout the nine-month program. Enrollment has consistently increased over five years, now cumulatively totaling nearly 50,000 students. The evaluation framework identifies four global learning outcomes—appreciation for diversity, cultural understanding, global knowledge, and global engagement— and five general learning outcomes, including digital literacy, language communication, self-efficacy, academic engagement, and critical thinking. An effective global digital exchange program should show growth in these nine outcomes, which taken together define global competency for K-12 students. To make the outcomes measurable, we identified 112 empirical indicators across the nine outcomes, grouped within the developmental competency areas of knowledge, skill, attitudes, and behavior. We recognize that not all indicators will be observable in every setting, and so by providing this wide range of indicators, the framework makes it possible for educators and evaluators to identify what global learning looks like in the classroom. The empirical indicators can also be used to formulate measurement tools that consider student progress or improvement over time. More than 70 representatives of the Global Scholars network are gathering in New York City this week to continue the conversation about the importance and purpose of global digital education and how to evaluate its impact on cities worldwide. Attendees will hear from Michael Bloomberg, three-term mayor of New York City and philanthropist, who will open the meeting as he has every previous Global Cities symposium. Mayor Bloomberg will speak to the need to make sure our children become globally competent 21st-century adults. John B. King, Jr., former U.S. Secretary of Education, will also address attendees, as will Kevin Guthrie, president of ITHAKA. King will speak about the importance of assuring equity for low-income students and students of color; Guthrie will speak to the opportunities—and the hazards—that instantaneous digital communications represent for student learning. Read the full report: Evaluating Global Digital Education: Student Outcomes Framework. Read more about student learning outcomes. TAIPEI. Global Scholars in Taipei, Taiwan had everything they needed for a successful Community Action Project, although they confessed to some self-doubt. First, they reviewed data from a school survey they had conducted as part of Feeding our Cities. They learned that Taipei schools throw out 10 tons of food each day. 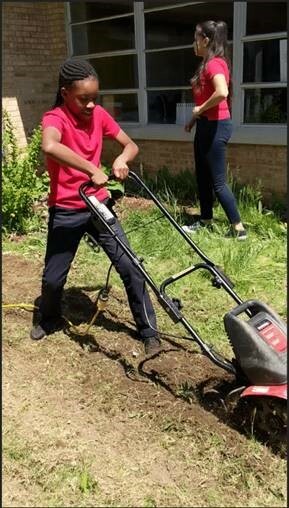 For the final Community Action Project, Global Scholars knew they needed to search for bite-sized solutions to global problems, something they could do in their own schools and cities to make an immediate difference. "We are collecting the fruit peel from the tea shops and our school lunch to make dishwashing soap!" Food waste was one challenge; skepticism about taking on such a large challenge was another. “Students think these projects are fun, but they still doubt if they can make a change in school and community,” reported their teacher, Lingyun Chang. “The hardest part will be to make our action project successful,” confesses a Taipei Global Scholar. That doesn’t mean that students ages 10-13 need to solve the world’s problems before summer arrives. But they do benefit from identifing problems and taking local action. A global e-classroom provides exposure to new problems and allows students to consider the impact their actions might have on their peers, communities, and even world. Taipei students found ideas and encouragement for their Community Action Project in the Global Scholars e-classroom. They also found inspiration in their community, visiting a local nature park to see how a professional created something delicious and healthy from food on-hand. Encouraged, the students began to collect leftover rice from their lunches. They completed their poster advocating for better lunches, securing signatures of support from teachers as well as the principal. They even worked with local tea shops to collect leftover fruit peel. Each action helped students envision small actions with clear personal pay-offs. The rice balls, for instance, would not only salvage food leftover from lunch, but would fend off a common afternoon problem among middle school students: "it can make me not hungry in the afternoon." Early results are promising. The school lunch vendor, for instance, "accepted our opinion and poster and have committed themselves to providing students better school lunch next semester!" As for sharing rice balls with other classes, Lingyun reports: “The students eat the rice balls they make! We are sharing the idea with other classes so that they can make their rice balls if they want to 😊” Inspiring others is a form of community action, too. See community action projects around the world on Twitter by following the hashtag #GlobalScholarsTakeAction. BUFFALO, NY. While exploring their school’s food environment earlier this year, middle school students at Dr. Lydia T. Wright School of Excellence—P.S. 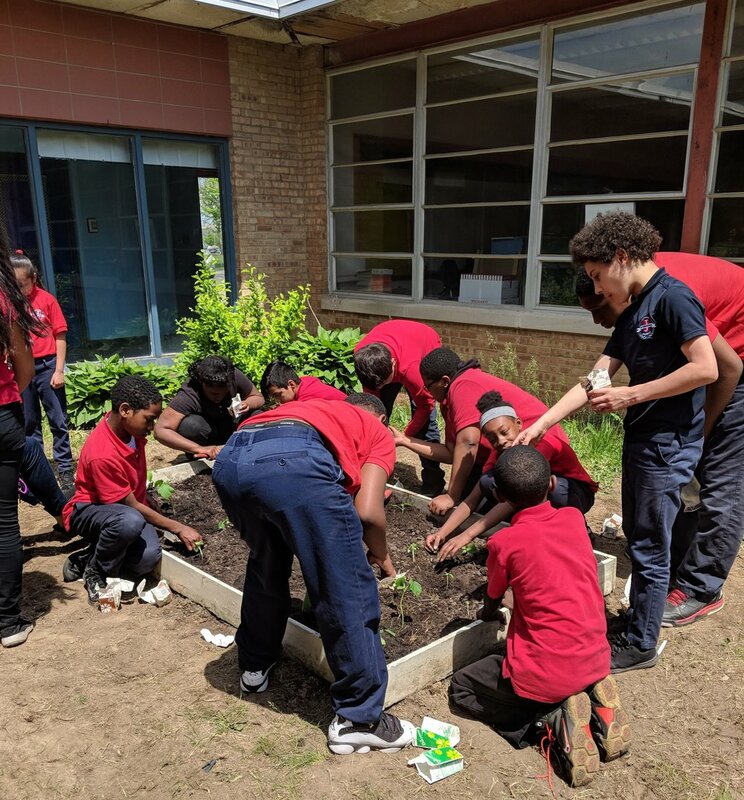 89 in Buffalo, NY—noticed that there were few sources of healthy food nearby, and that some students couldn’t identify benefits of eating fresh fruits and vegetables. Across town at P.S. 81, students conducted a survey of food waste and were surprised to see how much good, healthy food was thrown away daily at their school. At Herman Badillo Bilingual Academy P.S. 76, students discussed the difficulties of growing food year-round in the northeastern Buffalo climate. So each class took action. These problems and solutions came into focus last Wednesday, June 6, at the Culmination Program for Global Scholars Buffalo, in which students from eight Buffalo middle schools showed off their Community Action Projects. P.S. 81 wrote a cookbook to offer families—and the school cafeteria—delicious ways to prevent food waste. Carrots alone could become carrot chips, carrot soup, or glazed carrots. The Home Economics class demonstrated another option, converting ripe bananas to banana oatmeal muffins to serve at the Culmination Event. P.S. 79 envisioned a school community garden with a self-watering innovation that could run year-round and use water wisely. "It was a showcase of what students have learned and accomplished this year in Global Scholars," said Pamela Littere, Instructional Technology Coach at Buffalo Public Schools. "The teachers and students did a wonderful job sharing their experiences with the many students, parents, school leaders, teachers, and community members who attended the event." by helping to stop food waste." Buffalo is one of 64 cities participating in Global Scholars worldwide, allowing students ages 10 through 13 to connect with one another and to share projects and observations as they follow a shared curriculum. This year's theme was Feeding Our Cities. Students study global issues that affect all cities, such as food security and access to clean water, and the final Community Action Project lets them see that their actions make a difference. "In the future I could use what I learned in Global Scholars by helping to stop food waste," said one Buffalo student. "I could plant my own food. Also, I could travel easier since I know a little about other countries in the world." A highlight of Wednesday's Culmination Program was a live Skype chat with Global Scholars from Seoul, South Korea. Details such as time of day, what's for lunch, and today's weather become magical when shared with peers halfway across the world. Throughout the year, most of the interaction in Global Scholars is digital. Students post projects and ideas to the e-classroom and comment on the work of their international peers, learning to use English in a formal online setting, to communicate respectfully, and to share opinions and digital-project tips. In turn, they receive first-hand reports on a thrilling range of cities and perspectives. VIDEO: Global Scholars at P.S. 89 in Buffalo document their journey from idea to school community garden. "The most important thing I have learned about ways of life around the world through Global Scholars is that everyone is different and unique," said a Buffalo student, "and to accept another person's culture." Find out more about the link between global digital education and student learning outcomes. After studying urban farms, students in Barcelona visited a local artichoke farm created on an abandoned lot. As a next step, they will launch their own food-related community action project. Get your work boots on, because Global Scholars in 64 cities are launching year-end Community Action projects and we are following along in our new Twitter Series, #GlobalScholarsTakeAction! We’ll cheer on all classes and travel step-by-step with Detroit and Taipei. Discussions are just beginning in these classes about what community action means, what local food issues they might want to tackle, and how they will go about it. We’ll share each week on Twitter from our handle @GlobalCitiesOrg. Join us! Middle school students have many “aha” moments as they study the global food system. Many didn’t know the distances some foods travel to reach their plates. Others didn’t realize how much of their food is grown locally. Most reported shock when they learned how much food is wasted in the course of feeding a city or a school. Global Scholars ages 10-13 have spent the past 8 months studying “Feeding Our Cities.” They started with their own cities, interviewing food workers, surveying their schools on food waste, and creating posters, infographics, and videos of their findings. Then they shared digital projects with 13,000 peers around the world via our secure e-classroom and discussed one another’s work. Those global connections are coming in handy now, as students take global lessons back home. at the end of the day. We are going to talk about what we can do to rectify this situation. 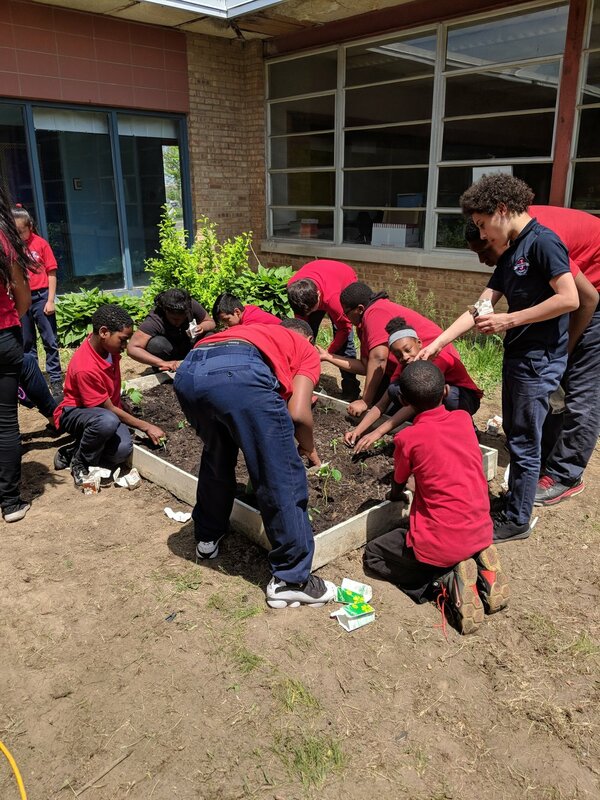 The community project takes the project-based approach beyond the classroom and even the e-classroom, asking students to step into their school courtyards, local parks, or wherever they see a need and a possible solution. Students tap critical thinking as they observe that some members of their community need food, while others throw away excess. They develop a new sense of self-efficacy as they brainstorm solutions. And as they share discoveries and plans with distant peers, self-efficacy can turn into global engagement. It’s one thing to imagine ways to irrigate your urban farm in Madrid; it’s another when a kid your age in Cape Town couldn’t do that because of a water ration. Seeing how students your age respond to the same assignment in different ways prompts productive conversations about diversity and the many factors that influence perspective, such as climate and culture. “Kids have enough cognitive ability at this age to be pretty sophisticated on perspective-taking,” says Dr. Jeanne Brooks-Gunn, Professor of Child Development at Columbia University. “Looking at other cultures and cities is a perfect activity for this age because they can take the other perspective, which is much harder to do than if we were focusing this program on second and third graders.” In other words, an important window into global citizenship opens in middle school. Cities benefit from a new cadre of informed, engaged, digitally-literate community members. The hope is that they will also benefit from whatever solution the students propose and build to address the common challenge of #FeedingOurCities. The overall goal of Global Scholars is to build global competency skills for today’s students, who are after all tomorrow’s global citizens. The program advances four critical student learning outcomes of global education, identified by Global Cities: appreciation for diversity, cultural understanding, global knowledge, and global engagement. The last point includes communicating and collaborating with diverse communities to find solutions to global problems—and no better place to get started on those problems than locally. So follow us on Twitter at @GlobalCitiesOrg, or just search for the hashtag #GlobalScholarsTakeAction! And thank you students and teachers; we need all the solutions we can find. As a new school-year begins, Global Cities Inc. continues to grow as more schools and cities join our Global Scholars network. We are also growing our leadership, and we are delighted to welcome three new members to our advisory board – Jeanne Brooks-Gunn, Charlynn Goins, and John B. King Jr. Our new board members bring a rich and varied set of experiences in the fields of education and youth development. Jeanne Brooks-Gunn is the Virginia and Leonard Marx Professor of Child Development at Columbia University’s Teachers College and the College of Physicians and Surgeons, and she also is co-director of the National Center for Children and Families. In her work and research, she focuses on family and community influences upon the development of children and youth. 2009 through 2014, and continues to serve on its board. From 2008 through 2015, she served on the Board of Directors of Fannie Mae. She is a member of the Council on Foreign Relations, the Century Association, and the New York Women’s Forum. John B. King Jr. is President and CEO of the Education Trust, a national nonprofit organization that seeks to identify and close opportunity and achievement gaps, from preschool through college. He served as the U.S. Secretary of Education from 2016 to 2017 under President Barack Obama. He is noted for his lifelong commitment to education as a teacher, principal, and school system administrator, and for his passion for advancing educational equality for all students. The arrival of our new board members is particularly timely as we prepare for our Paris symposium, Students and the Global Edge: Evaluating the Global Education Experience. At the meeting we will release our white paper on best practices for defining and evaluating student outcomes in the field of international digital exchange. Global Cities looks forward to drawing on the guidance of both our new and existing board members for these upcoming milestones and for our greater mission of cultivating the next generation of global citizens. Education leaders and teachers are eager to help their students learn about each other and cultivate skills for global citizenship. Global Scholars, a program operated by Global Cities, Inc., has been a leader in this area; last year, more than 10,000 students in 26 countries participated in our peer-to-peer digital exchange program. Global Cities is sponsoring the Students and the Global Edge: Evaluating the Global Education Experience symposium this October, bringing educators from our network together in Paris to explore outcomes desired from digital exchange and to discuss how we can evaluate the impact of these programs on students. At the meeting, we will present an extensive white paper on digital global exchange and student outcomes, drawing on several years of significant classroom experience from our Global Scholars curricula, platforms and professional development workshops. We’ll join with our participants to consider strategies for evaluating and increasing the effectiveness of digital student exchange programs. Global Cities is dedicated to readying students to become thoughtful stewards of the human future, and we are excited to build on this work by developing ambitious field standards for international digital exchange. Beginning in 2018, the Programme for International Student Assessment (PISA) test for 15-year-olds, administered by the Organisation for Economic Co-operation and Development (OECD), will include global competency. Middle school is a critical time for young people to develop skills for living in an inter-connected world and participating in a workforce where they will be communicating with people from around the globe. Model initiatives to prepare students for an inclusive world are being tested today through international digital exchanges, such as our Global Scholars program. Our worldwide network of 10,500 students age 10-13 provides the opportunity to gain global competency skills, attitudes and behavior, with no fee to schools. Urban school districts are encouraged to apply to the Global Scholars program. Priority is given to school districts that present an effective plan for providing leadership and support on the district level. Interested district leaders can email globalscholars@globalcities.org to learn more. Buffalo Public School students who have participated in the Global Scholars program this year came together on June 8 with educators, parents, and administrators to celebrate and showcase their student work. Speakers at the event included Assistant Superintendent of Buffalo City School District Dr. Fatima Morrell, and Meg Louis, Vice President of Global Cities, Inc., as well as a few Global Scholars who also came up to the podium to present their work to the audience. The event culminated in a Skype call between Buffalo students and their Global Scholars peers in Tokyo, Japan. The students exchanged questions with each other about their favorite parts of the program, information about their cities and schools, and their favorite sports, music, food, and books. Global Scholars from both sides were excited to find out about several shared interests. The Global Scholars curriculum ends with students creating a Community Action Project that makes a difference in their school or city. One of the projects displayed at the event featured students who partnered with a felt manufacturing company that was disposing their excess felt in a landfill. The students repurposed the excess felt and designed products such as wallets, bags, and cardholders, which were successfully sold at an art fair. 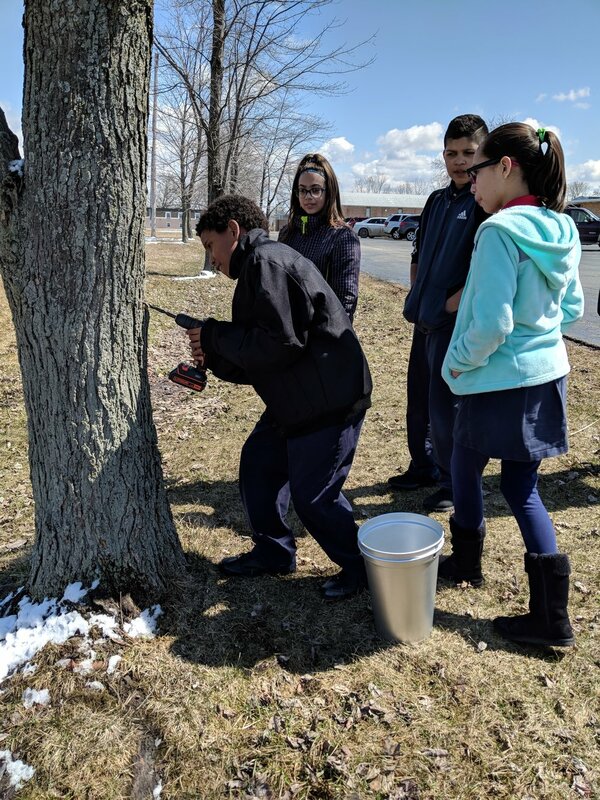 Throughout the year these Buffalo students learned about the links between technology and sustainability, saw an opportunity to develop a project, and were able to address a local issue through investigation and collaboration. Our Global Scholars program offers educators a constructive approach to counter recent trends of xenophobia and intolerance. Using digital technology, students interact across different cultures, gaining an appreciation for diversity and curiosity about the world at an early age. In this effort, we have found common ground with Out of Eden Learn (OOEL), developed by Project Zero at the Harvard Graduate School of Education. Global Cities, Inc. has committed $250,000 to OOEL’s online learning community that fosters thoughtful cross-cultural inquiry and exchange. As presenters at our symposium last year on The Future of International Digital Learning, OOEL shares our interest in evaluating student outcomes in digital exchanges. Students who participate in these programs are learning from one another in e-classrooms that are geographically diverse. Global Scholars and Out of Eden Learn provide cross-disciplinary curricula that support broader school-specific goals and motivate students to develop an interest in learning about the world and solving global problems. “The world has its dangers, just as your hometown does,” said Paul Salopek, a Pulitzer-Prize winning journalist and National Geographic Fellow, speaking to OOEL students who are following Paul on his Out of Eden Walk around the world. He added: “The world is your home, too. Don’t fear it.” Whether building cultural understanding, sparking a desire to communicate or connecting peers around the world, Out of Eden Learn is helping to cultivate the next generation of global citizens. We are pleased to have them as an ally in the vital field of global education. Global Scholars is the signature program of Global Cities, Inc., a program of Bloomberg Philanthropies. There are no fees to schools for participation in Global Scholars. Space is available for urban public school districts. Priority is given to districts that enroll multiple schools and provide local leadership. If you are a district leader interested in finding out more, please email globalscholars@globalcities.org.